Santa Rosa Retirees Club President Art Fahrner with the “Guerneville Gang” plaque. At the November meeting of the IBEW 1245 Santa Rosa Retirees Club, retiree Greg Kestel presented Club President Art Fahrner with a plaque that hung on the wall of the PG&E Guerneville Service Center, a relic from his days as a part of the “Guerneville Gang” back in the mid-80s. Fahrner recently returned to his President duties after having suffered a broken hip accompanied by a long and painful recovery. 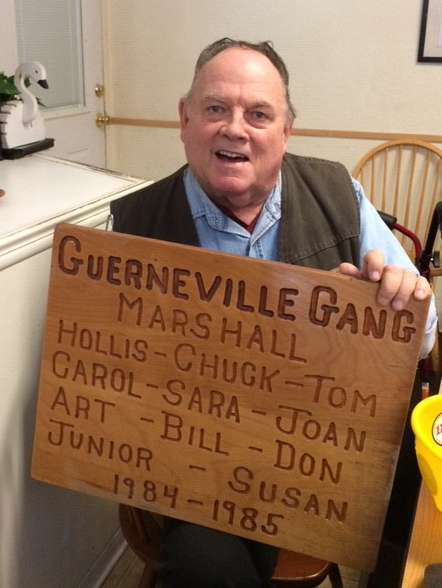 It’s great to see him back with the brothers and sisters he loves so much, not to mention seeing that smile on his face when Brother Kestel (who also worked for many years out of the Guerneville customer service front office before retiring recently) presented him with the old Guerneville Gang plaque.